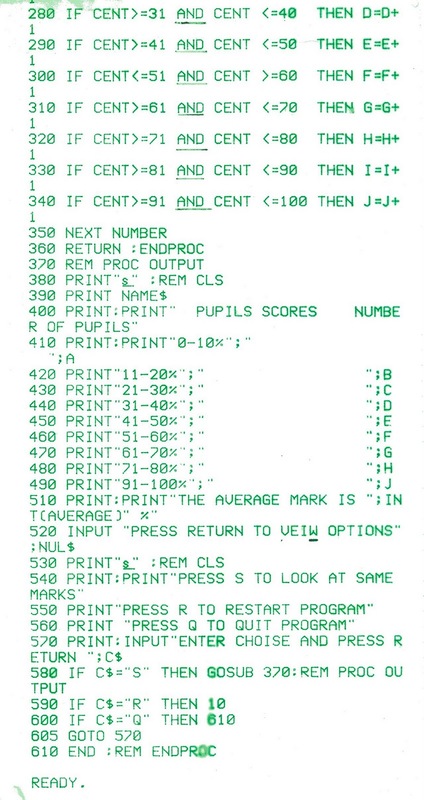 The first program draws a spiral, I'm not sure if I wrote this or if it was from one of the user guides, however you can see I wasn't that good at commenting code then. 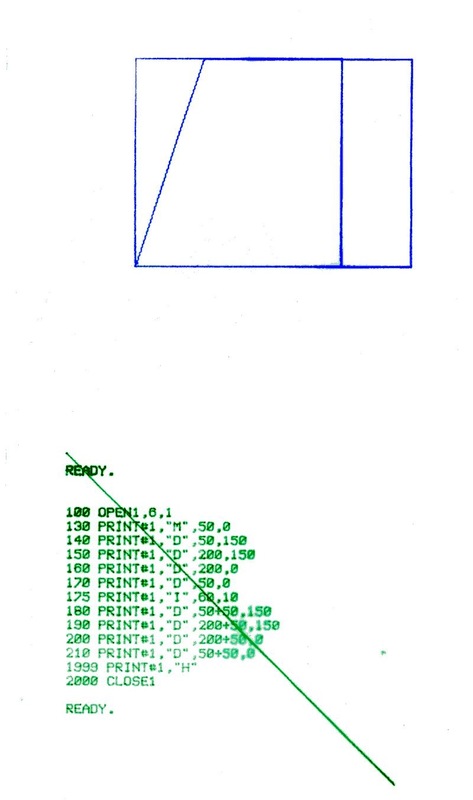 The next scan seems to be my attempt at doing some kind of 3D drawing but I guess I wasn't happy with it as the code is struck through with biro. Finally I think this may have been some computer homework, as it's the usual class grade calculation (I remember being pissed off of having to do this again when I did my degree ;-) Note the crossings out and comments. 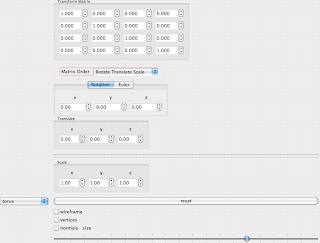 I won't bother to critique the code, but it does look very naive but hey I guess it still works. 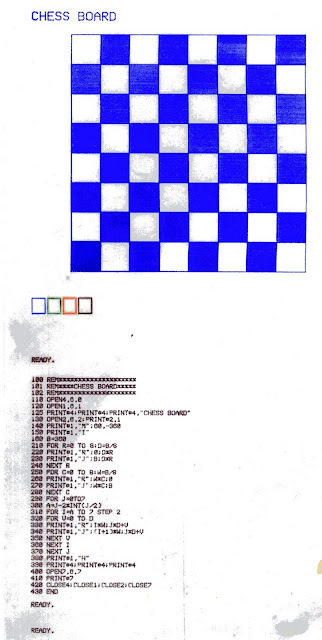 Will have to try and did out some more old code one day, always fun to look at it. In the previous post I discussed the initial design of the Shader Manager class and outlined the design of the Shader Class. 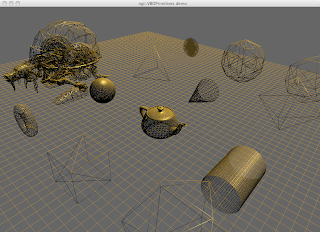 This post will concentrate on the design of the ShaderProgram class which contains the actual Shader sources and be linked and ready to use with GLSL. 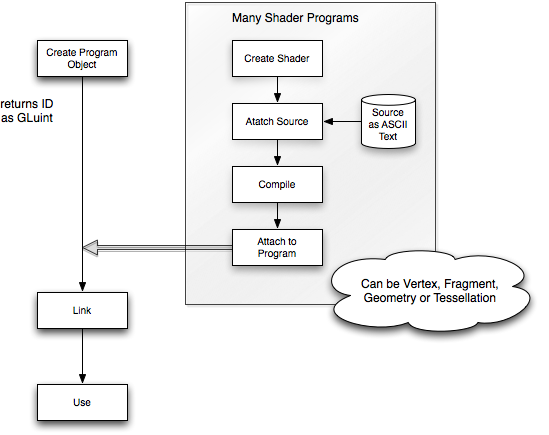 To this end we need to create an empty program object then attach the existing shaders to the program. The attachment can be made before the shader is compiled, however the Program object can't be linked unless the shaders are compiled. 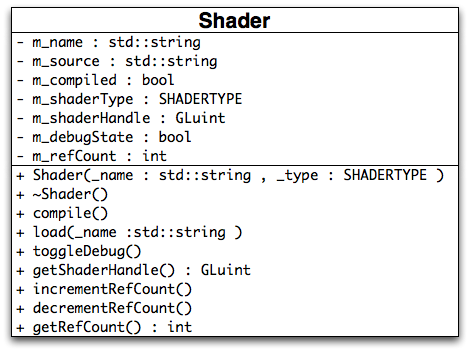 As shaders may be attached to more than one Program we basically need to hold a list of pointers to the shader objects rather than the shaders themselves. The ShaderProgram will also be the main access point to the shaders once loaded on the GPU so it will have all the methods for accessing the attributes in the program. As OpenGL is a C based library there is no method overloading so we need to implement a method for each of the different accessors, in this cas the class have over 50 methods, however for brevity the class diagram only show the basic ones as seen in the following class diagram. As part of the design it was also decided to allow attributes in the shader to be bound using a std::string so they could be referenced by name and not the numeric id. In the constructor we check for a special name called "NULL" this integrates with the ShaderManager class so we can create an empty default shader object with an ID of 0. 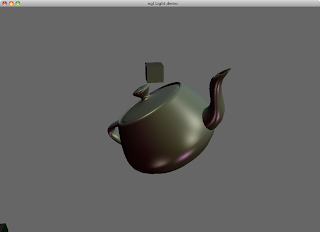 GLSL uses the 0 shader to represent the "fixed functionality" pipeline. By default the ShaderManager class will create a NULL shader so that if the named one passed by the user is not found a fixed shader will be returned and calls to this object will not crash the system. At present if the link fails the program will exit, I'm not sure if this is actually the best approach but will do for now as this a developmental system. If we wish to bind the attributes in the shader we can do it before the link of the programs or after however each approach needs a different coding approach. At present binding is only available before linking, however this will be modified in the next version to check the link state and use the appropriate method. 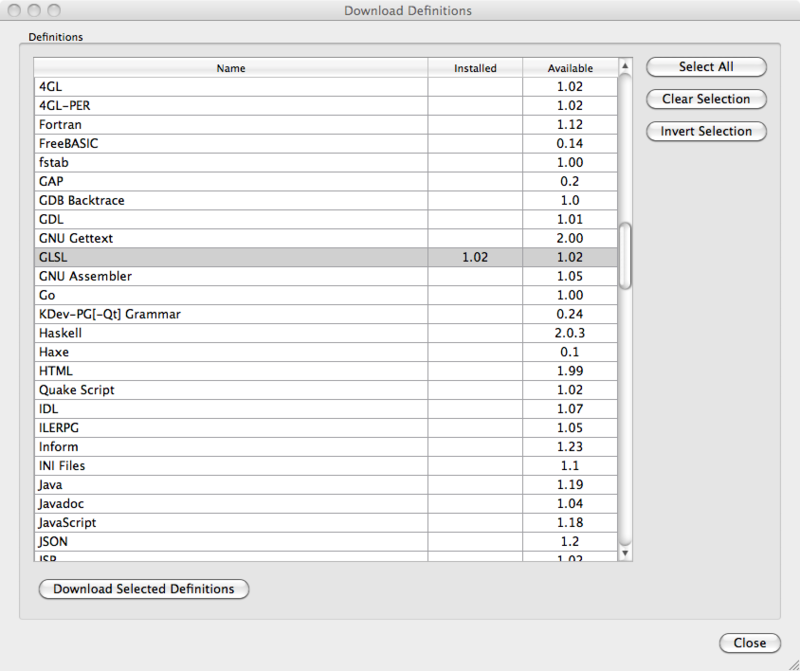 Attributes must be specified by the user using a numeric value and the name to be bound. 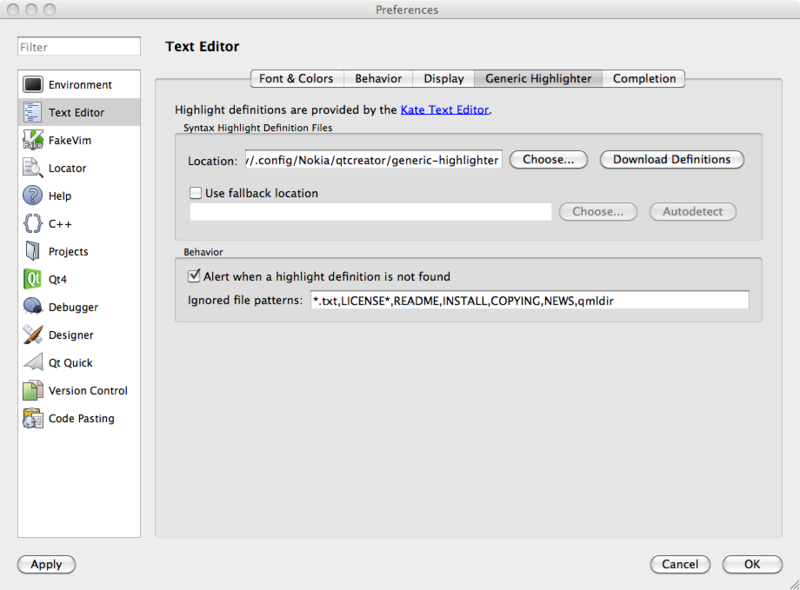 Once this has been done the user may then specify attributes by name only. The rest of the class is rather repetitive code to allow the different attributes and uniforms to be accessed, the next post will look at the overall management class for the Shader system with examples of how it's used. The program still works but as the key "c" is not know it will output a value of 0 for the line mymap["c"] however it will also insert a new map entry and the 2nd call to mymap.size will return the size 3. To overcome this behaviour we must use the find method as shown in some of the examples above. Rost, R, Licea-Kane B (2009). OpenGL Shading Language. 3rd. ed. New York: Addison Wesley. 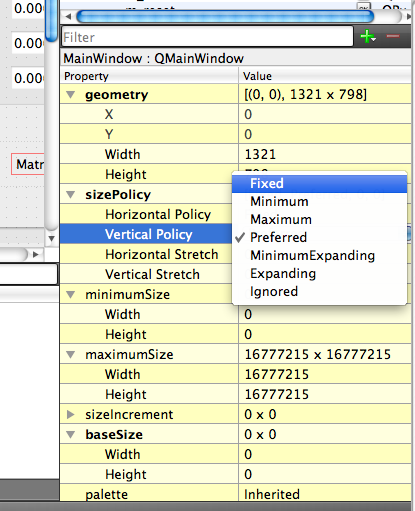 Just been re-writing my lectures for the OpenGL Shading language and decided to re-design my shader manager to be more compliant with the new specification. 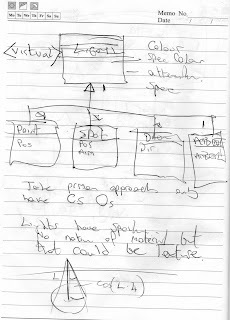 When I designed my original system I was using the 1st edition of the Orange Book which I got at a 3D Labs master class in 2004 and is now quite outdated. 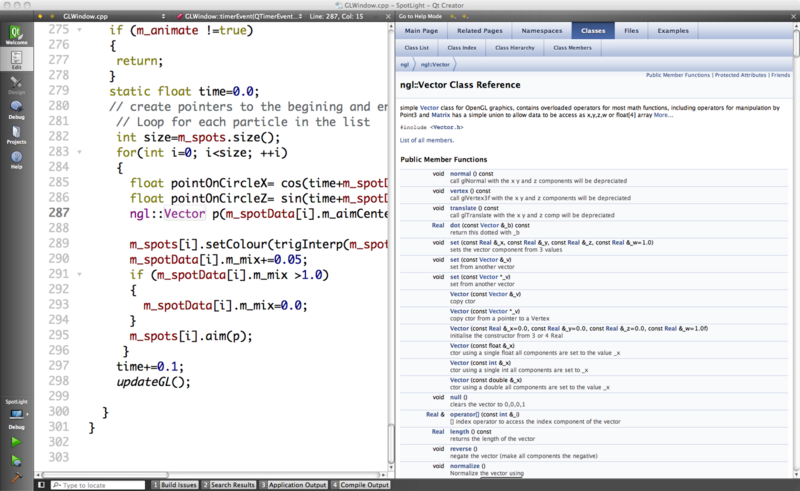 I've recently go the 3rd edition of the book and read the GLSL API spec and started to design the new system. The main initial criteria is for it to work as a standalone system without the need of my NGL:: library however it will also be integrated into the library at some stage to replace the existing one and be compatible with the ngl:: datatypes such as Matrix, Vector, Colour etc. The present system is designed create a single Shader Program by passing in a source file for Vertex, Fragment and optionally a Geometry shader. 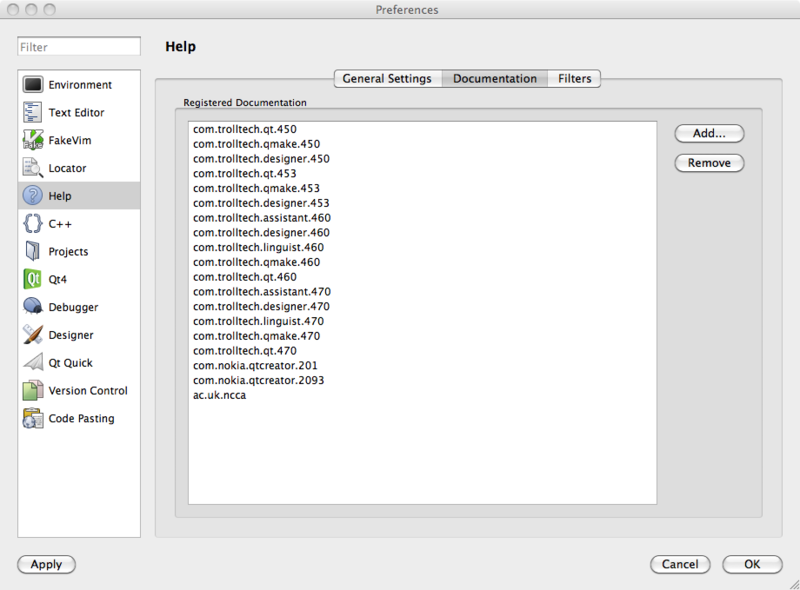 However the specification says any number of shaders can be created and attached to a Shader Program before compilation. To this end the initial design will separate the Shader and the Program into different classes then have the shader manager contain both the Shaders and the Programs. Programs will be stored using a std::string name for the user access, and as much as possible the Shader attributes / data values will be accessible via a text string. The following diagram illustrates the basic process of generating shaders and a shader program. From this process I decided to design the Shader class first as it is a fairly passive class. The outline of the class is as follows. 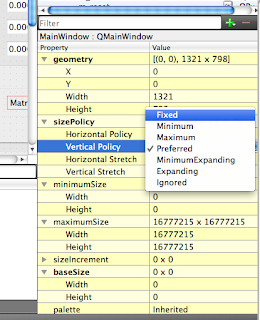 The main consideration is the class may belong to any number of Shader Programs so a basic reference counting mechanism is being built into the class so the ShaderManager class can see how many references the Shader has, I was initially considering using a boost::shared_ptr class to do this but want to reduce the dependancies on the standalone version. For the eventual ngl integration I may add this as ngl already relies on boost for a number of things. 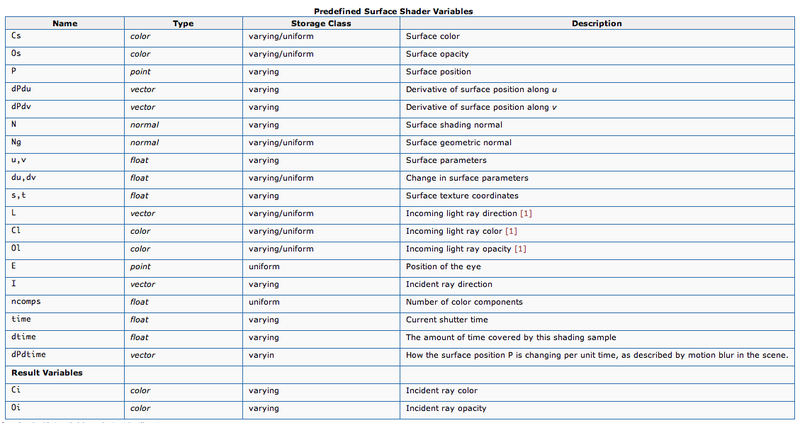 each shader must be constructed as one of the types which map to the GL data types for shaders. 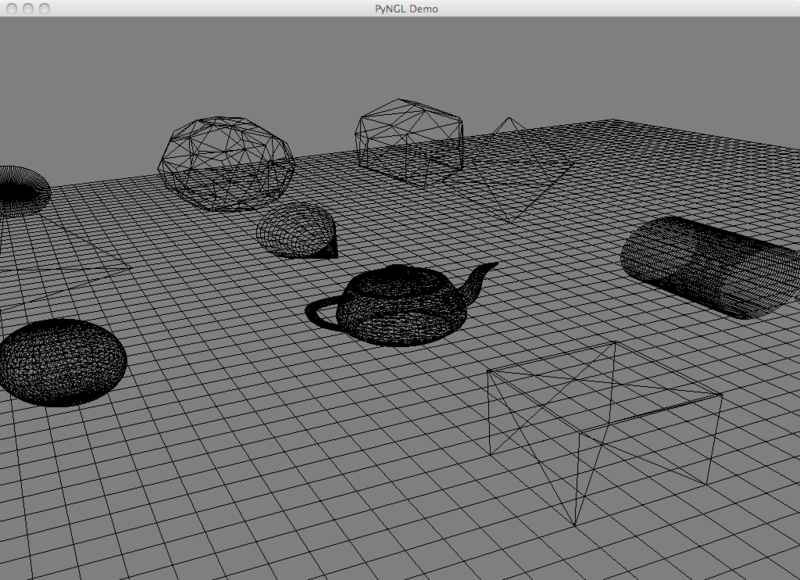 I've added tessellation as an option but don't have a GPU to support it as yet but trying to make things future proof. 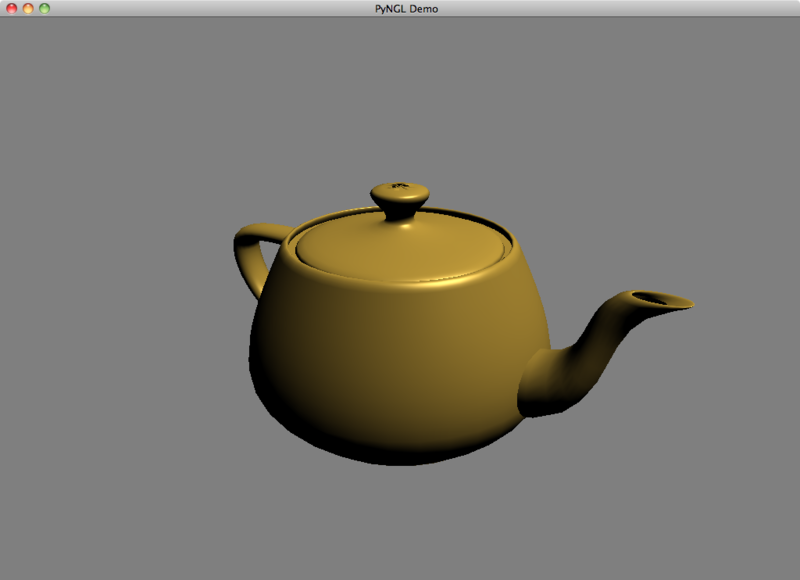 The handle returned from the glCreateShader function is the one used by OpenGL for the rest of the stages. This is about it for the Shader class, I decided to keep the shader source as part of the class but it's not needed once attached to the shader so will perhaps write methods to allow the deletion of the source to save space once the shader is compiled. click on the add button and locate the NGL/docs/html/index.qch and add it. Just downloaded QtCreator 2.1 beta-2 from here and it seems to work quite well. It's added a feature I've been looking for for ages which is syntax highlighting of non C++ files, to configure it you need to do the following. Just been writing tomorrow's lecture on interpolation and decided to write a simple function to demonstrate the 3 different types I would be using. Most of the maths in this post is based on the Excellent "Mathematics for Computer Graphics" by John Vince every computer graphics person should own this book it's only £20. 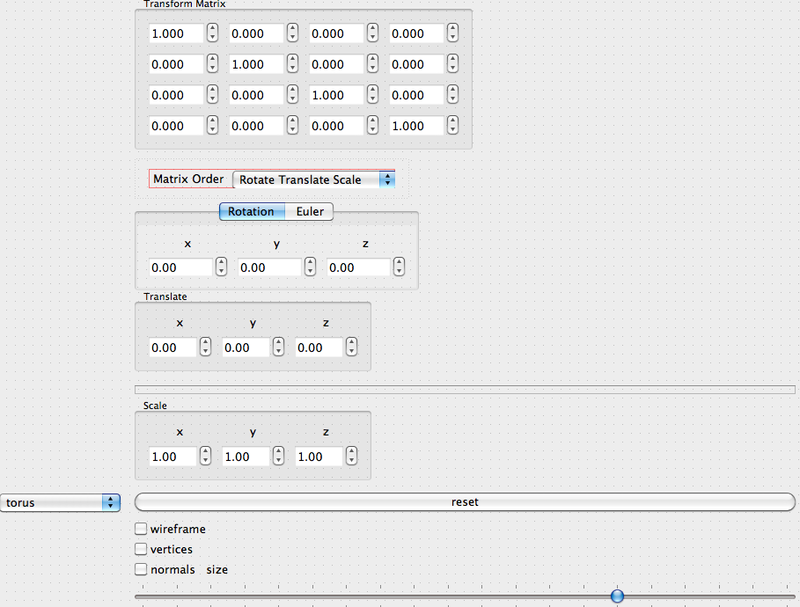 A Linear interpolant ensures that equal steps in the parameter t give rise to equal steps in the interpolated values. However it is often required that equal steps in t give rise to unequal steps in the interpolated values. We can achieve this using a variety of mathematical techniques. You will notice that the path along the line is now non-linear, to write a Trigonometric interpolation function we need to form our values to range from 0-90 for a range of 0.0 - 1.0, further to this we need to convert these values to radians. In cubic interpolation we need to develop a cubic function to do our blending. and when \(t=0\), \(v_2=0\) and \(d=0\). Similarly, when \(t=1\), \(v_2=a+b+c\). You can see the ease in / out effect of the two non-linear interpolants and the linear one moving at a constant rate. Vince, John (2010). Mathematics for Computer Graphics. 2nd. ed. London: Springr Verlag. 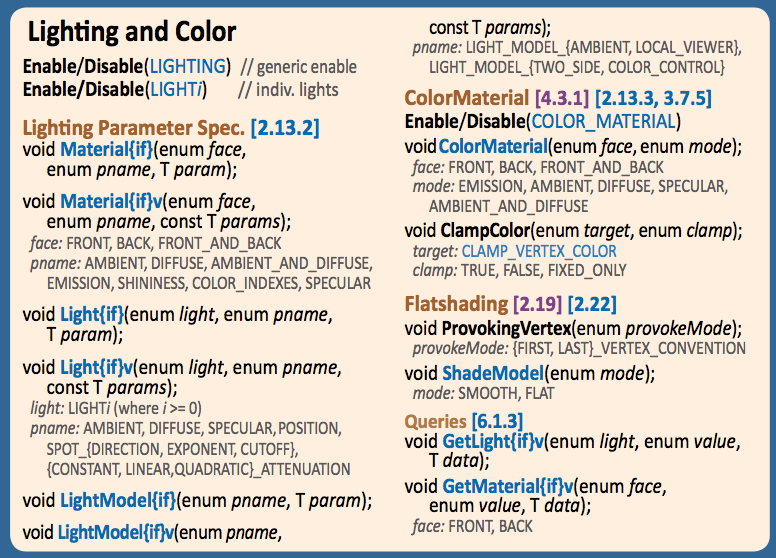 Have been re-reading the OpenGL quick reference card again and looking at all the elements that have been deprecated. 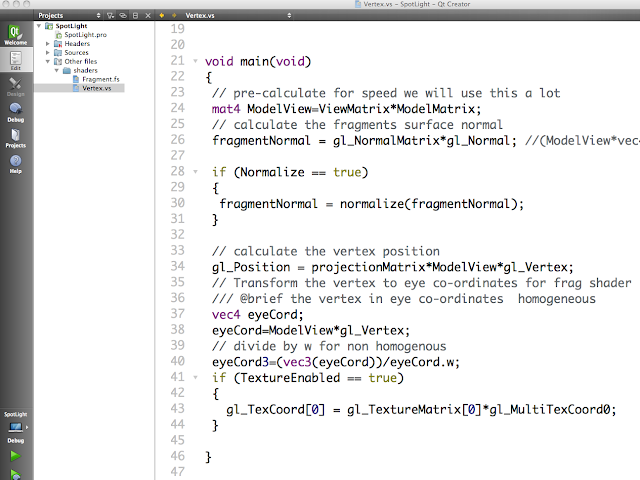 It would seem that most of the light / material elements have been removed from the "core profile"
As you can see all of the Light / Colour elements have been deprecated as well as the materials, this means that we will no longer have any access to these elements in the shader and structures such as gl_LightSource and the colour elements such as gl_FrontMaterial. So we need to be able to pass both light and colour information to our Fragment shader and then use this in the calculations. 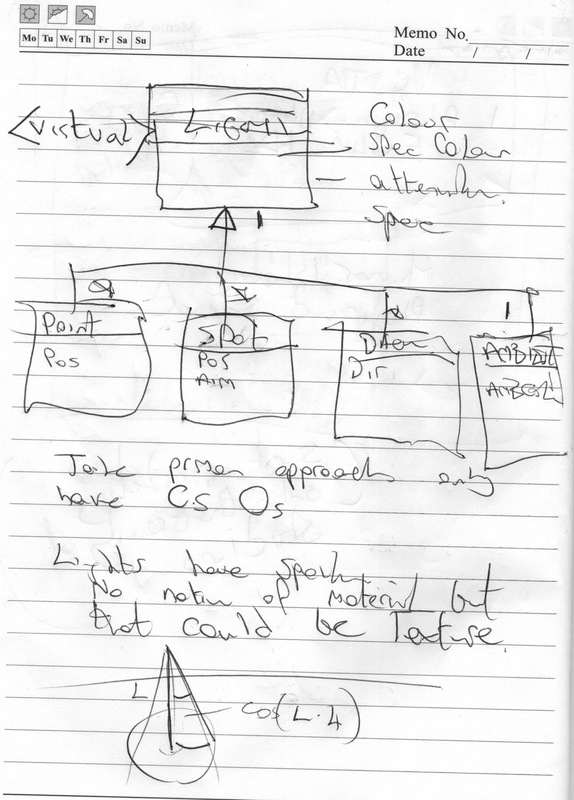 This sounds a bit similar to how renderman works so I decided to design the initial system around renderman's lighting model. 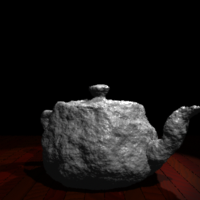 Whilst we will not have all these variables available in the GLSL shader we can imitate most of it, and make our lights behave in a similar way to the renderman ones. This is going on the back burner for a while as I have loads of other elements to sort out but at least I can bear this in mind whilst re-writing some other parts of ngl::. 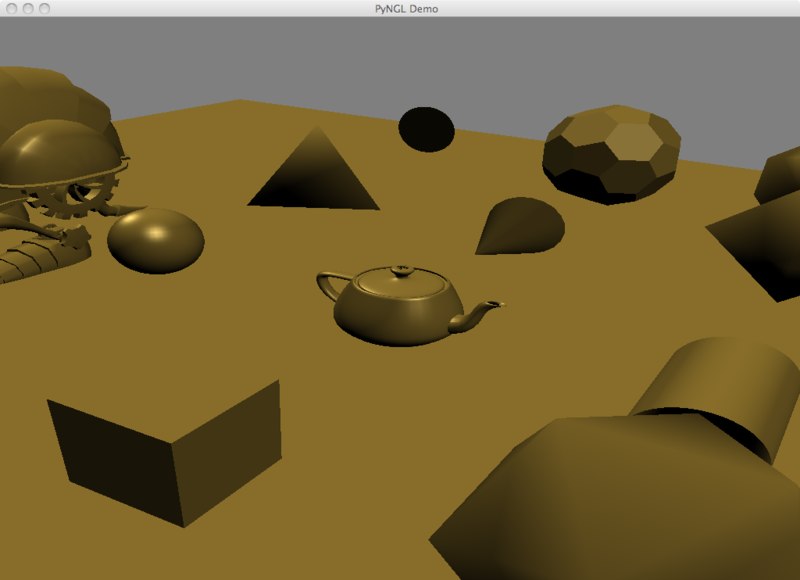 So next to write the Fragment shader to set the colour / shading properties of the elements being processed. We now need to loop for every light in the scene and accumulate the total contribution from each and set the final fragment colour. 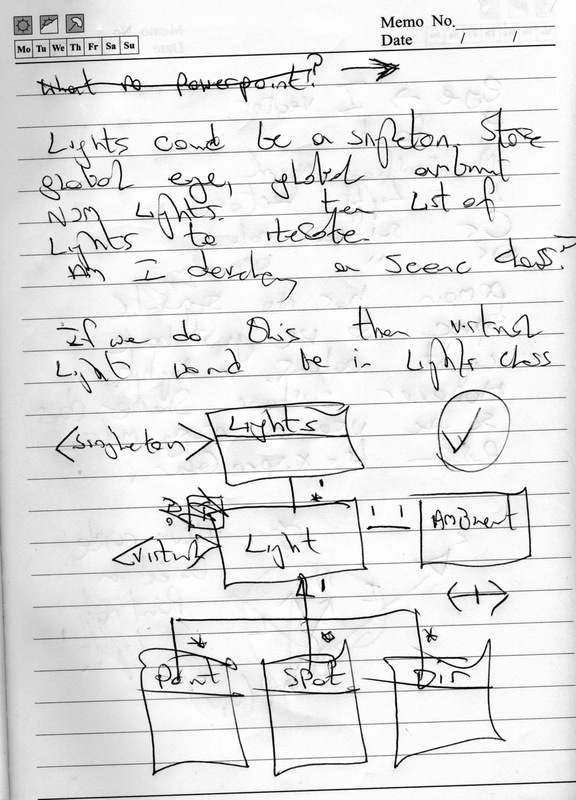 Directional Lights are the simplest lighting model to compute as we only pass a vector indicating the lighting direction to the shader. 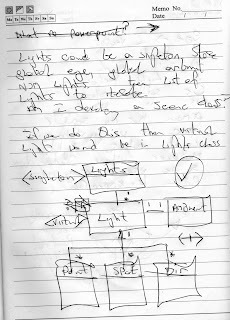 OpenGL only has two basic lights one called a light the other a spotlight, to differentiate between Directional lights and Point lights OpenGL uses a homogenous vector to indicate which light to use. *Note after re-reading the spec this has also been marked for deprecation so this will have to be replaced in the next iteration ! 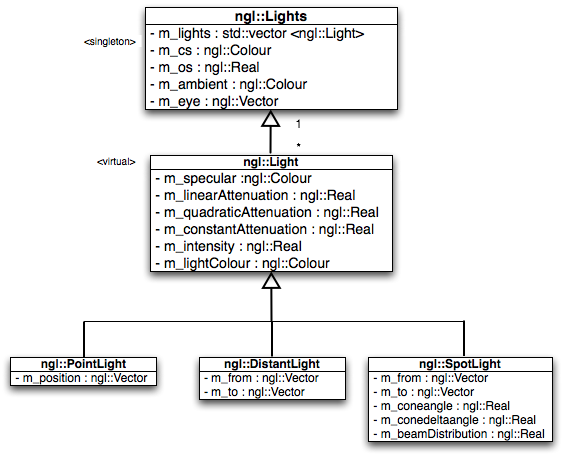 This structure is passed data from the OpenGL glLight mechanism and the existing ngl::Light class will set these value for us. To calculate the diffuse we take the dot product of the fragmentNormal with the normalized version of the light position vector the result of this will be multiplied by the material diffuse property to calculate the diffuse colour. Next we determine if we have any specular contribution, if the diffuse is 0 then we have not contribution so we set the powerFactor to 0 and specular will not be added. If we do we calculate the dot product of the fragmentNormal and the pre-calculated by OpenGL halfway Vector, this is then raised to the power of the specularExponent which is passed as the shininess parameter of the material. The following image shows two directional lights shading the scene and you can see the direction of the two highlights for the two different sources. The point light is an extension of the directional light and adds in attenuation over distance as well as calculating the direction of the maximum highlight for each vertex rather than using the halfway vector. 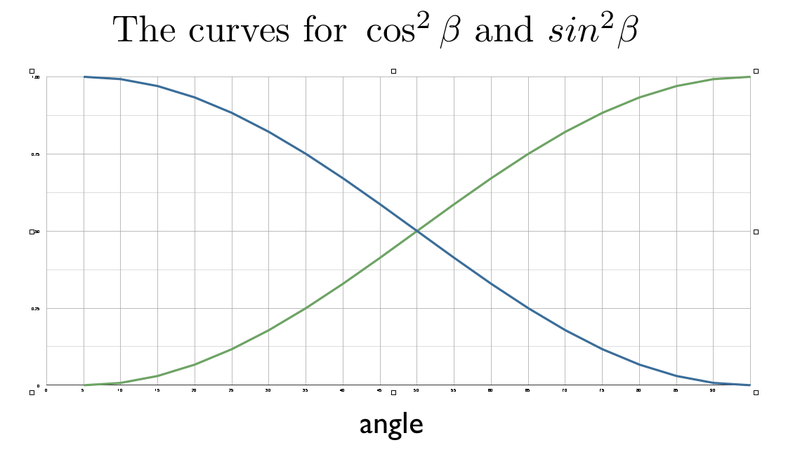 The main difference in this function is the calculation of the vector VP which is the vector from the surface to the light position, we then calculate the length of this to determine the distance of the light from the point being shaded. This will be used in the attenuation calculations to make the light strength weaker as the fragment is further away from the light. The following image show the basic pointLight in action with two lights placed in the scene one above the sphere and the other over the cube. So when converting some of my demos I decided to do the spotlight demo from last year, this uses the built in OpenGL spotlight and the normal fixed functionality OpenGL pipeline. 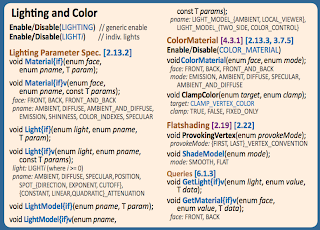 Begin / End primitive specification - Begin, End, and EdgeFlag* (sec- tion 2.6.1); Color*, FogCoord*, Index*, Normal3*, SecondaryColor3*, TexCoord*, Vertex* (section 2.7); and all associated state in tables 6.4 and 6.5. 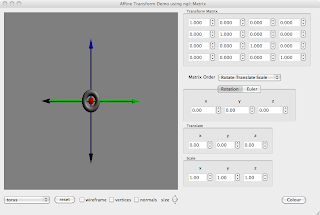 Vertex arrays and array drawing commands must be used to draw primitives. What this basically means is the immediate mode OpenGL is no longer core to OpenGL 3/4 and we must use the GPU as much as possible. Most of this work involves the OpenGL matrix stack and the use of immediate mode, which is slow and inefficient and not available in OpenGL ES (used for mobile devices such as iPhone). 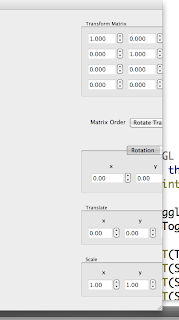 NGL already supports the use of GLSL shaders and with the ngl::Transform and ngl::TransformStack classes we can do all of the glRotate, glTranslate, glScale functions as well as the glPush/PopMatrix commands. 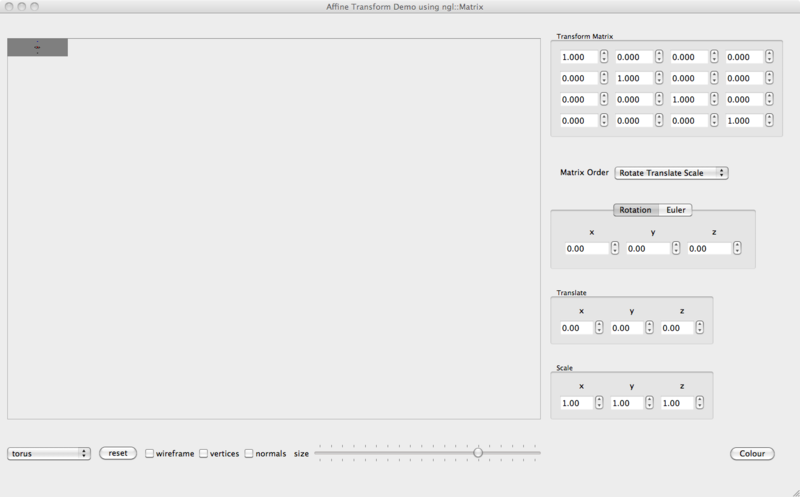 There are also methods built into the Transform / TransformStack to load these matrix values to a shader to use in GLSL. 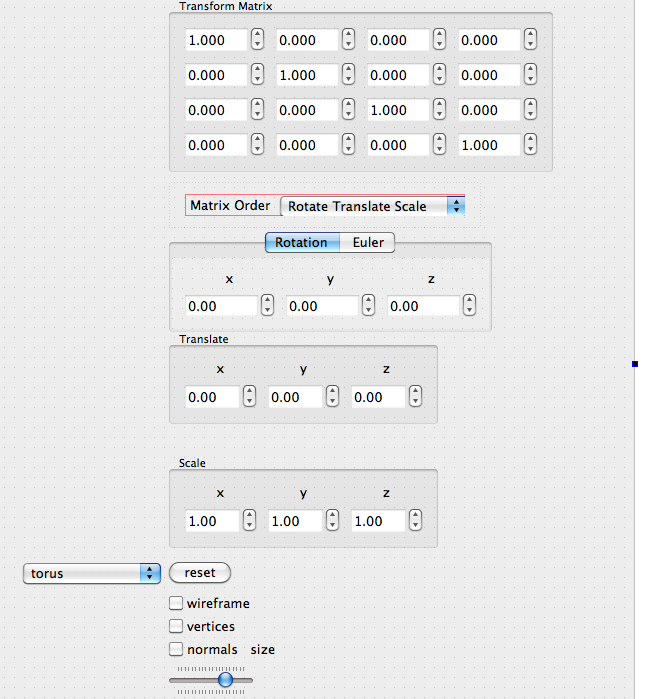 This is easy to implement as the ngl::Camera class will calculate these values based on our Virtual Camera configuration of Eye, Look and Up (for the View matrix) and Current Transform Stack for the Model element of the ModelView matrix combination. 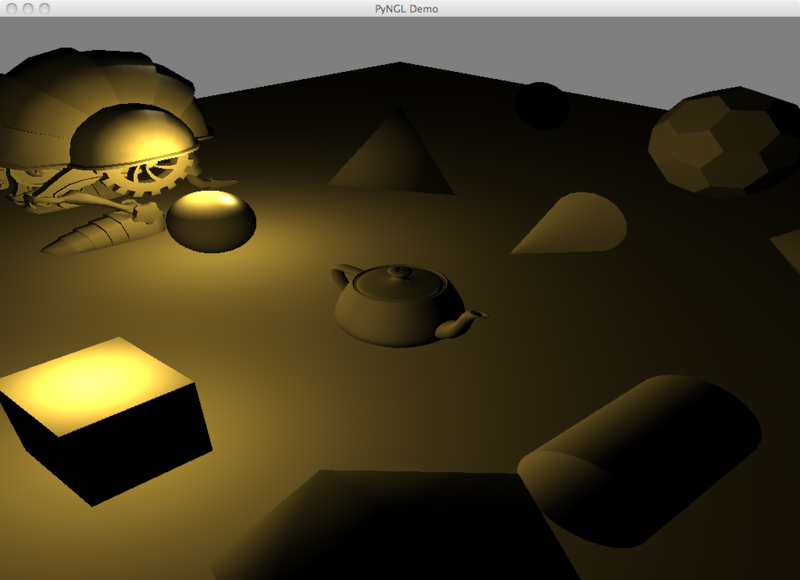 The projection is also calculated in the camera class and loaded to the shader. The following Vertex shader shows the calculaition of the current Vertex based on these values as well as the fragment normal. 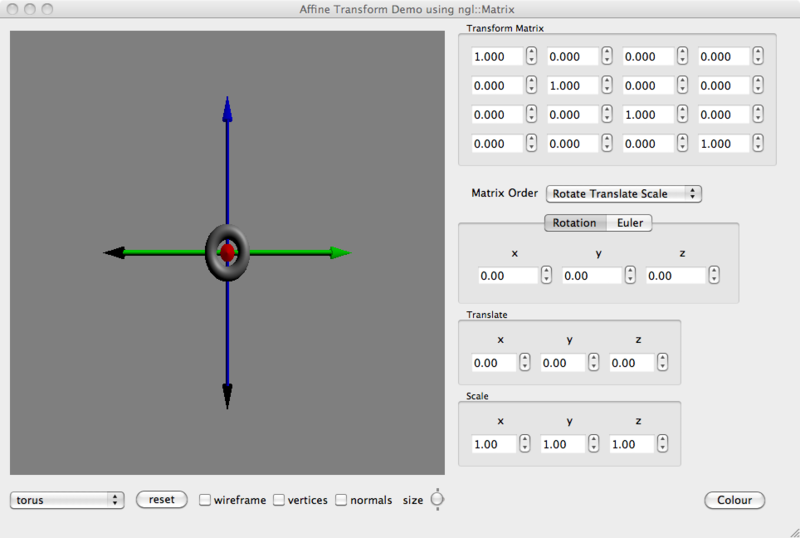 In the above example the uniform mat4 variables are passed to the shader from our program and represent the current state of the MODELVIEW and PROJECTION matrices at the time of the vertex processing. For example usually we would set the projection of the camera and the view from the camera once a frame (or if fixed at the start of the program), then the modelling transformations of the current set of vertices will be set to position our objects as show in the following configuration code. Next we need to look at lighting and material properties and how to shade everything. This is where it get complicated, and will be in the next post. 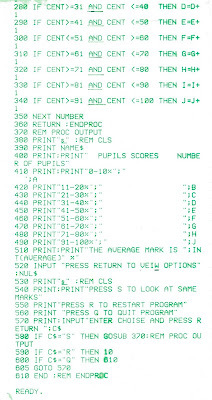 Been updating some of the demo code I use for this years lectures been quite useful doing the Python and C++ API at the same time as it's highlighted a few bugs in the system and I've cleaned up a load of silly C++ code that makes no real sense in the Python implementation. Finally re-factor all the NGL code to match the Qt method standard using lower case first word then Camel case for each following word. 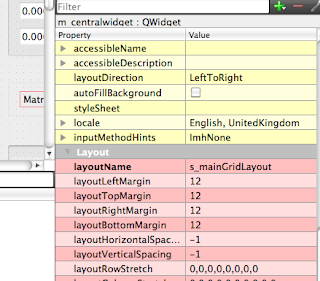 First time round it went really wrong as I mended a couple of const bugs at the same time breaking most of the code. This shader is passed the values calculated for the projection (from the NGL::Camera class) as well as the Model and View transformations. This shader calculates the shading values based on the 1st GL light in the scene. It calculates ambient diffuse and specular contributions based on the current openGL material passed from the NGL::Material class. We use a basic diffuse / lambert shading model for the diffuse contribution and the half way vector for the specular shading to mimic Phong / Blinn reflections. 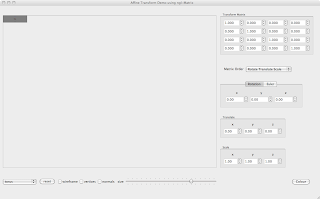 I've been re-visiting my AffineTransforms demo to add a GUI to it, I quickly created a suitable ui in Qt Designer and got the program running. First off you need to think about how the UI should look and what you are actually trying to achieve, Qt has 4 main layout options Form and Grid are the main ones for the type of UI I was going for (decided the splitter one was not really applicable to this project). No really what I wanted, "oh well lets try the Grid Layout"
So I decided to "read the source" and see what the uic produced in the .h file from the form. 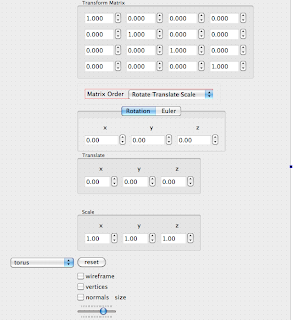 As we have 6 widgets across the bottom of the screen (the controls for choosing the model etc) this is the size we need. All the code looks the same and makes it easier to integrate into a larger code base. 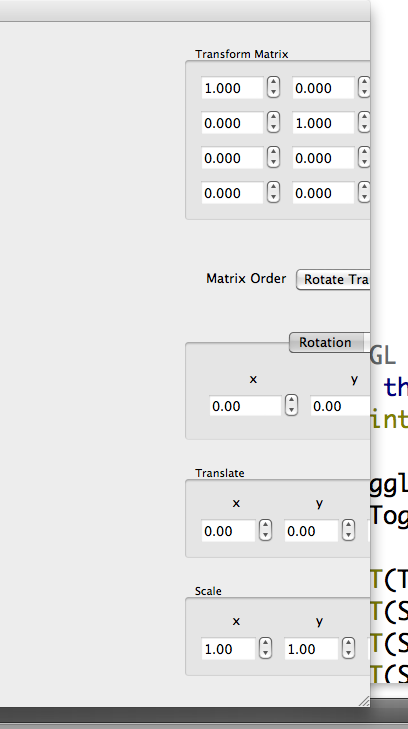 When the original standard was published the code base for ngl was based on OpenGL and SDL however this year it has all been ported to Qt as this seems to be the new standard for most animation apps. Function names have the first letter of each world capitalised, with no underscores between words. Each function should be preceeded by a comment containing a brief description about the function (how it works, what it does) above the function body in the .cpp file. This means we have a mixed standard in most programs, I could re-factor the ngl: lib but this would take a while and break quite a lot of legacy code (which is still in the process of being re-written anyway). Think I will wait until Monday and decide then. After a lunch time design meeting (in the Ship) Luiz decided that the name Jon's coding blog was crap, so after much discussion it was decided to call this blog "Jon's Teapot". The main motivation for this is the fact that most of my demos include some form of Utah Teapot, and it is also an oblique reference to Russell's teapot as well. 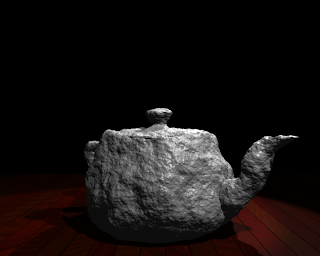 The basic scene was created using a Python for Renderman script below, this script is a two stage script which generates shadow maps by moving the camera to the position of each of the lights and rendering a Z depth map which the special shadowspot shader uses to calculate the occlusion. Once these maps are generated the final scene is rendered using these maps. # might be in negative z, but not afterward. # component, and the rotated x,z vector from above.